At a presentation in New York City this week, DJI unveiled its new Phantom 4 drone featuring autopilot, auto-follow, and obstacle avoidance. In every demonstration, both live and on video, the Phantom 4 was shown being used in tandem with Apple gear, whether an iPhone or iPad. 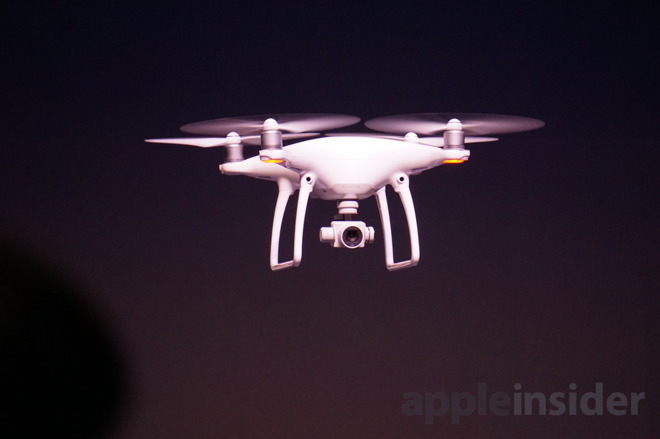 DJI also revealed that the Phantom 4 will be available exclusively at launch through Apple's retail stores and its own storefront, before expanding to other third-party resellers. The partnership will see the new Phantom 4 featured prominently at "feature bay" displays in Apple Stores across the globe. 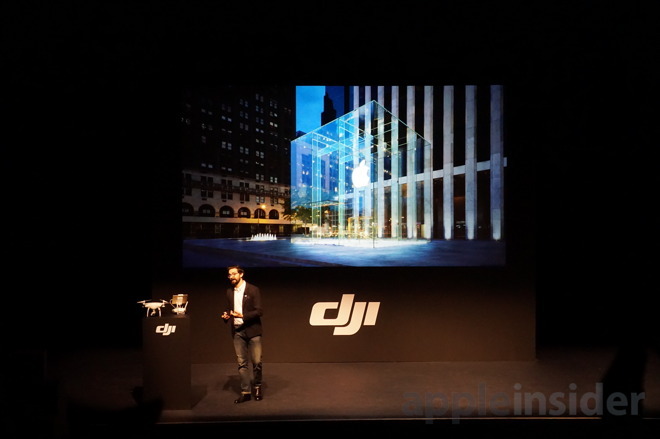 Michael Perry, director strategic partnerships at DJI, explained that most of DJI's customers are already Apple product users. Widely considered to be the leader in the "prosumer" drone market, DJI's exclusive arrangement with Apple is representative of how the Chinese company hopes to position its brand and grow marketshare. Perry also cited Apple's ecosystem of devices that integrate with and supplement DJI's offerings. Beyond the iPhone and iPad —which allow for controlling and viewing live footage from the Phantom series —he also noted that Apple apps like Final Cut Pro and even iMovie are the go-to editing choices for many DJI customers. Priced at $1,399, the Phantom 4 is available for preorder now via Apple or direct from DJI. It will begin shipping to customers on March 15. The device relies heavily on the official DJI Go app for iPhone and iPad. With it, users will be able to use their fingertips to select a person, object or otherwise to track, and the Phantom 4 will take to the skies and follow that subject while intelligently avoiding obstacles.